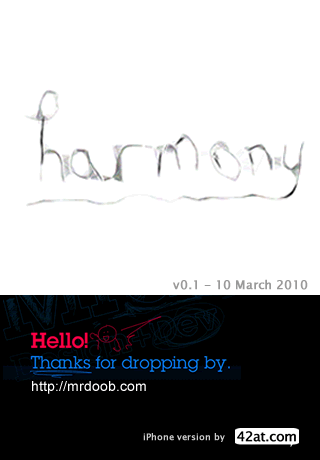 Saw this nice little sketching app called Harmony, a procedural drawing tool, by Ricardo Cabello (via Daring Fireball) that uses HTML5 canvas. Works nicely on the iPhone too, so I thought it would be a great to have it as a webapp. To use the full-screen & offline mode on your iPhone/iPod Touch(/iPad? ), bookmark the page and select “Add to Home Screen”. Alas, the autosave feature doesn’t work on the iPhone OS 3.1.3 due to the canvas origin-flag bug (hopefully this’ll be fixed on OS 3.2!). It works nicely on FF 3.6, Chrome 4.x, and Safari 4.x. After a brief delay after the last user stroke (about 5 secs), the state of the canvas and the last brush is saved to sessionStorage (or localStorage in the case of Chrome as it doesn’t fully support sessionStorage yet). If localStorage is available (as in the three browsers mentioned) and ‘save‘ button is clicked, the canvas is also saved to local storage. So even if the browser is restarted, it’ll start at the last saved canvas. Thanks to Ricardo Cabello for this great tool. Note: As Ricardo mentions in the comments to his post, you can take a snapshot of the canvas on the iPhone/iPod touch by pressing the power button and home button at the same time. This is probably the best way to save/share on the iPhone. Update 1: 11 March 2010 — fixed offline issue. Please re-install on iPhone/iPod Touch.